11th October is the International Day of the Girl. Girls face multiple challenges, purely because of their gender: from being denied an education to being forced into child marriage; from being judged by their appearance to having their voices ignored. ActionAid supports girls living in poverty on Day Of The Girl, and every day. Find out how we’re making a difference to girls’ lives around the world. Girls across the world are supporting each other to tackle gender stereotypes. Read the blogs below and share with your friends to celebrate the power of girls and their vision for the future. 20-year-old Athar shares her experiences with us via WhatsApp, from Gaza. 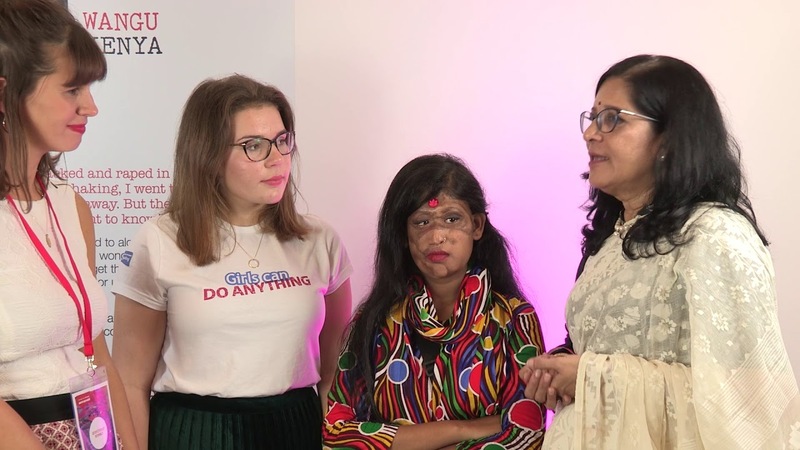 Watch 16-year-olds Caitlin and Sonali reflect on our Survivors’ Runway fashion show and speak out for International Day of the Girl. How 14-year-old Abigail helped her best friend, Purity, escape FGM in Kenya. Why is giving equal opportunities to girls so important? Apart from the simple fact that girls are equal to boys and so should be treated equally, helping girls is key to tackling poverty. …are more likely to support themselves, feed and nurture their children, pass on their knowledge and contribute to society and their country’s economy. It not only helps them, but it helps their families, their communities and ultimately the world. What are the problems and what is ActionAid doing about them? There are lots of problems that stop girls from thriving and achieving their potential. These are just some of them, and what ActionAid is doing to help. Discover inspiring stories of how we're helping girls claim their rights. Help us do more to ensure girls are able to thrive and achieve their full potential.